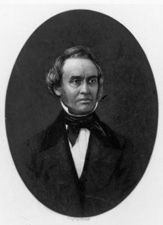 RANTOUL, Robert, Jr., a Senator and a Representative from Massachusetts; born in Beverly, Mass., August 13, 1805; attended the common schools and Phillips Andover Academy, Andover, Mass. ; graduated from Harvard University in 1826; studied law; admitted to the bar in 1829 and commenced practice in Salem; moved to South Reading in 1830, to Gloucester in 1832, and to Boston in 1838, and practiced law; member, State house of representatives 1835-1839; member of the commission to revise the laws of Massachusetts; member of the State board of education 1837-1842; United States district attorney for Massachusetts 1846-1849; elected as a Democrat to the United States Senate to fill the vacancy caused by the resignation of Daniel Webster and served from February 1 to March 3, 1851; elected as a Democrat to the Thirty-second Congress and served from March 4, 1851, until his death in Washington, D.C., on August 7, 1852; interment in Central Cemetery, Beverly, Mass. Dictionary of American Biography; Bulkley, Robert D., Jr. Robert Rantoul, Jr., 1805-1852: Politics and Reform in Antebellum Massachusetts. Ph.D. dissertation, Princeton University, 1971; Rantoul, Robert, Jr. Memoirs, Speeches and Writings of Robert Rantoul, Jr. Edited by Luther Hamilton. Boston: J.P. Jewett and Co., 1854.